RALEIGH, NC – “Shannon is a friend of mine I grew up with in high school,” said Chatham County Sheriff Mike Roberson. “He has an intellectual disability and has meant a lot to me going through life. “Shannon always has time for you. He always has an arm to hug you. He laughs at your bad jokes and likes the simple things. Shannon has taught me a lot of leadership lessons in life thinking about how much better the world would be if all of us were more like Shannon. 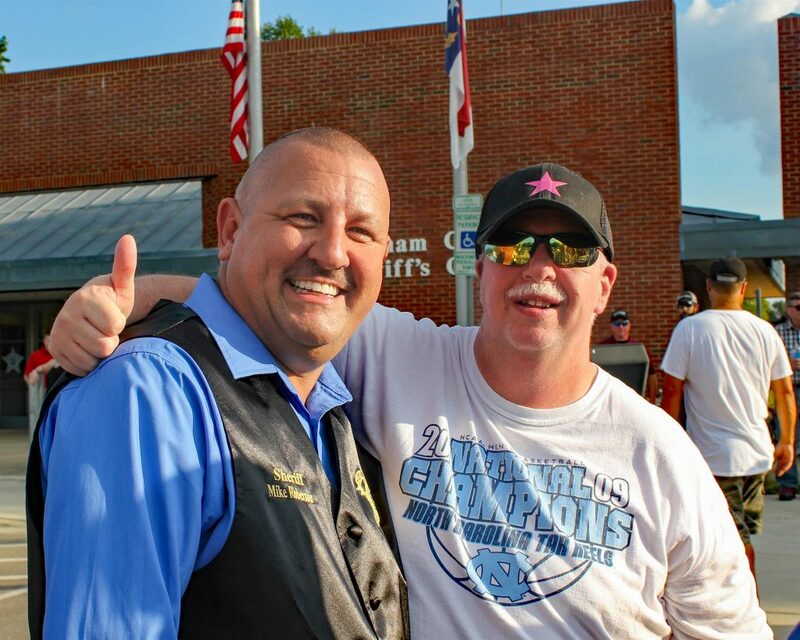 Sheriff Roberson is one of the thousands of law enforcement officers in North Carolina actively raising critical funds for Special Olympics programs including The Summer Games, The Fall Tournament, Polar Plunge, Truck Convoy for Special Olympics, The Plane Pull, Torch Run, and Over the Edge. Roberson, appointed Sheriff in Chatham County in 2016, wants to get high school students involved in Special Olympics. “You build support and create positive peer pressure, then bullying will be pushed aside,” said Roberson. “Special Olympics is a looking glass, an example to everyone around the world of how people with intellectual disabilities can and should be included in all aspects of their communities,” said Keith Fishburne, President and CEO of Special Olympics North Carolina. Eunice Kennedy Shriver founded Special Olympics and organized the first International Games in Chicago in 1968. Six athletes from North Carolina were among the participants. Special Olympics will return to Chicago and celebrate its 50th Anniversary in 2018. Special Olympics North Carolina provides year-round sports training and competition for nearly 40,000 children and adults with intellectual disabilities. Athletes train and compete on local and state levels in 19 sports, providing motivation, building self-esteem, and creating opportunities for success.